Explain why data is so important to AI. Explain how Sales Cloud Einstein eliminates busywork, making sales reps more productive. How do AI solutions like Sales Cloud Einstein make sales reps more productive? That’s the riddle you need to solve to convince your manager, Ava, that AI can increase your team’s sales productivity. Unfortunately, answering this question is about as tough as an overcooked meatball. You imagine his answer might be determining the best leads to pursue, figuring out which deals need the most attention, or determining the subscriptions in danger of not being renewed. However, Chip answers with two simple words: data entry. Everyone knows it: sales reps hate busywork. Creating CRM records, updating contact information, and logging activities all take away time from critical sales activities like developing customer relationships. Chip isn’t alone. Reports suggest that sales reps spend less than 50% of their time actually selling to customers. ( Docurated ) That means they spend most of their days on administrative tasks like logging activities and entering contacts. The results of a recent survey of Honeydew’s sales reps show just how much time is wasted on busywork. Reps reported that on average they spend nearly a third of their time logging sales activities. Fortunately, you tell Chip, Sales Cloud Einstein includes features that automatically log sales activities and create new contacts. To improve your sales reps’ productivity, Sales Cloud Einstein reviews their activities and provides recommendations and insights that steer them in the right direction. But, the key to great recommendations and insights is great data. Just how important is data to an AI solution? Peter Norvig, an AI expert, said that mediocre algorithms with more data get better results than great algorithms with less data. According to Computerworld , the rise in AI is largely due to the availability of big data sets, which lead to better AI. In the past, an AI solution required an entire test kitchen of data chefs who picked, cleaned, and combined your data before mixing it all up in recipes. Then, months or years later, out of the oven popped actionable insights for sales reps. Nowadays, everything—email, calendar, CRM, phone—creates trillions of data points. This deluge of information includes data on all your sales reps’ activities: their phone calls with leads, their emails to contacts, their CRM data on accounts, and much more! Sales Cloud Einstein harnesses all that data and feeds it to a flexible algorithm. Almost immediately, you get results. With Sales Cloud Einstein, you replace that test kitchen with an Easy-Bake AI Oven. 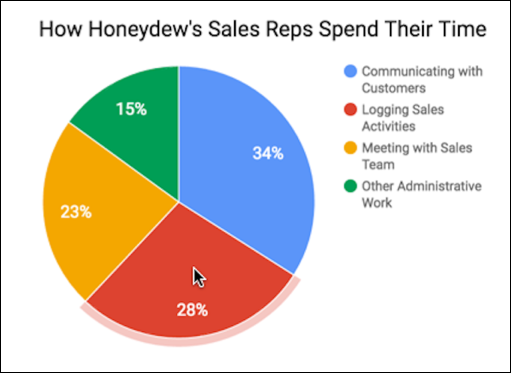 At Honeydew, your sales reps are constantly creating and updating data every second of the work day. You do a quick inventory of all that data. Your sales team is already creating all the data necessary for an AI solution like Sales Cloud Einstein. So now what? You’re excited to tell Chip that Sales Cloud Einstein, like some genie in the cloud, has made his wish come true. With a feature called Einstein Activity Capture, Sales Cloud Einstein finally lets Chip and his team say goodbye to the time-consuming busywork of logging activities. Sales reps just connect their email and calendar to Salesforce. Then, their activities are automatically added to related Salesforce records. Plus, emails sent from Salesforce go through their regular email account. Einstein Activity Capture lets Chip and his team connect any Google™, Microsoft® Office 365®, or Microsoft Exchange 2013 or 2016 account. Then, activities from those accounts show up automatically on business and person accounts, contacts, leads, opportunities, quotes, and contracts in Salesforce. You show Chip exactly how it works for Sally Cho, one of the top reps on his team. Her emails and events with Sarah Loehr, CTO for a key business partner, are automatically added to Sarah’s record in Salesforce. Chip is over the moon about the feature...at first. Chip’s first concern: Security. Many emails that Honeydew’s reps exchange with potential customers include sensitive information. He doesn’t want those available to everyone. Fortunately, Einstein Activity Capture lets your reps control which of their activities are added to Salesforce and who can see them. Reps can update those controls at any time either from Salesforce or their inbox. Chip’s second concern: Reporting. It’s great that Honeydew’s sales activities can be stored in one place. But Chip and his fellow reps don’t have time to create a whole new set of sales activity reports. Luckily, Sales Cloud Einstein gives you access to advanced analytics dashboards built on Einstein Analytics. Salesforce admins can evaluate the effectiveness of Einstein features. Sales leaders, managers, and reps can use the Sales Analytics app to glean deeper insights into their sales data. You show Chip a report for some of his reps, including Sally, and he’s mightily impressed. 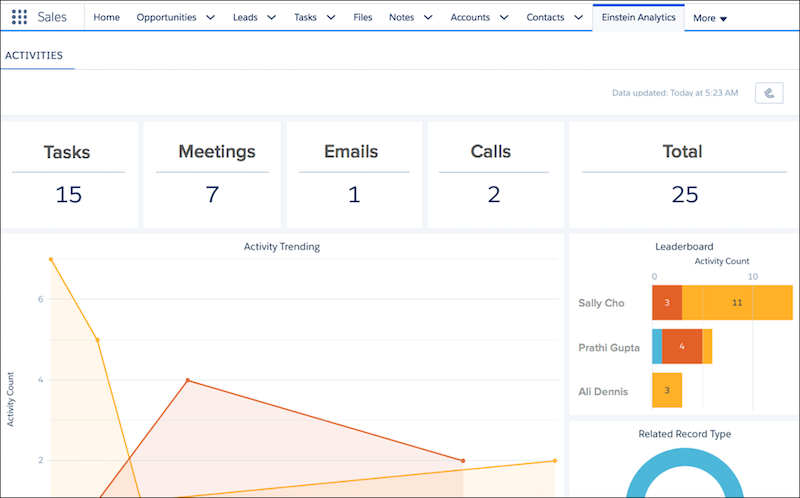 Einstein Automated Contacts uses email and event activity to find new contacts and opportunity contact roles to add to Salesforce. Depending on how the admin sets up the feature, Einstein can suggest the new data or add it automatically. Either way, sales reps stay focused on selling. 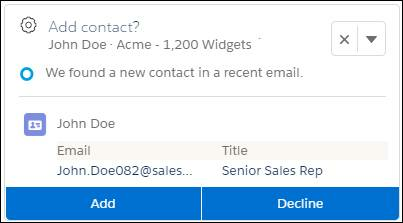 When the new data is suggested to reps, they can easily add it to Salesforce with just a couple of clicks. When the new data is added to Salesforce automatically, reps are notified when Einstein adds new data. And for new contacts, a list view shows them which contacts were added by Einstein. You share what you’ve learned with Ava about Sales Cloud Einstein. Imagine the time saved if sales reps don’t have to log activities or manually enter data! Ava sees the benefit and is clearly impressed with your diligence, but she isn’t convinced yet. Eliminating busywork is great, but what about the main part of each sales rep’s job: working through their part of the sales process with customers. “How does Sales Cloud Einstein really make sales reps more productive at each step of the sales process?” she asks. Sounds like yet another challenge. You know what to do. Read on to see if AI really can transform productivity at each stage of the sales process. Use these resources to learn more about the importance of data quality and how Einstein Activity Capture eliminates busywork for sales reps.